Terry L. Ettinger Horticulture Consulting Services - Recommended Spring, Summer and Autumn-flowering Bulbs for Central New York landscapes and gardens. I have not yet added any spring-flowering bulbs to my list of recommended plants. However, I'll be writing about some of them, such as the February-blooming winter aconite (Eranthis hyemalis) soon (photo at right)! 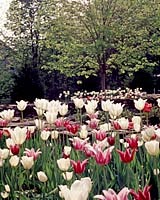 In the meantime, please keep in mind that for as beautiful as they are, tulips (photo at left) tend to be relatively short-lived in most gardens. They're also a favorite food of deer - to the point that they'll actually paw them out of the ground in the middle of the winter if they're hungry enough, leaving a huge mess! So as much as you may love them, you may need to prepare yourself to treat them almost as annuals - and you may need to avoid planting them at all if deer are a problem in your neighborhood.